A few weekends ago I drove over to Anderson, IN to listen to a locally born rising star perform for the Colts Fan Fest. 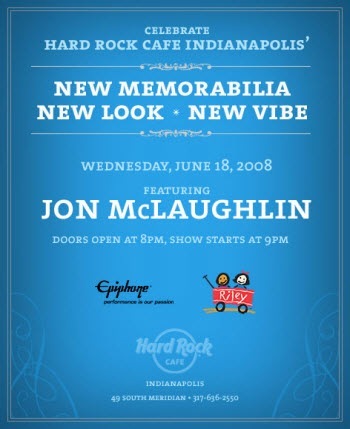 bnpositive: @vagabondrunn He’ll be performing at Hard Rock tomorrow night in Indy. You can stand me up for that one. vagabondrunn: @bnpositive jon is playing there?? …about a FREE show that he is performing downtown Indianapolis tomorrow evening at HardRock Cafe. I believe I will be attending…again. Who is one artist you could see every day and it NEVER get old? Hands down….Prince. His shows makes my skirt flip. If I could financially and everything, I would totally take a year off and just follow Relient K around. No joke. ok. no joke! Jon’s CD has been in my car, in the player, for 8 months straight! Every. Single. Time I get in I play it. There isn’t a song that i dislike. Hi voice, so smooth and controlled. His writing, amazing story teller. It just gets me every time!